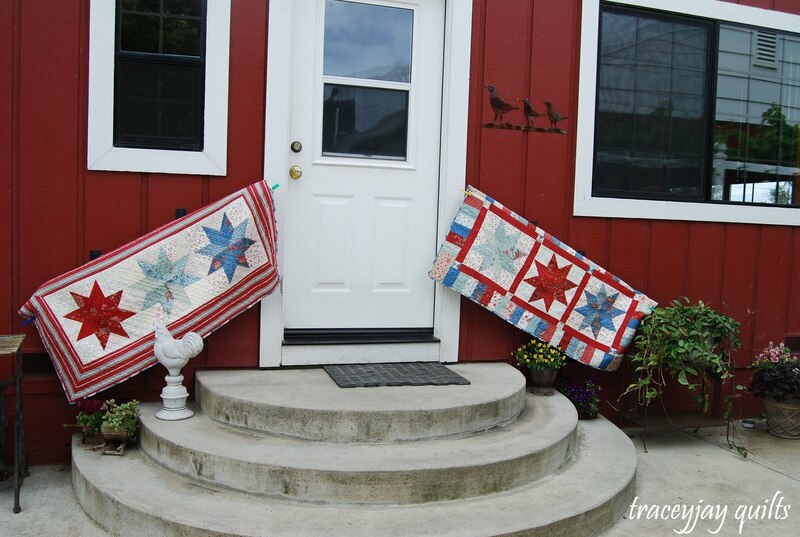 Because I made two versions of this runner, and because this is Memorial Day weekend, and because this quilt is made to celebrate independence, I am auctioning one of these runners off, and giving all the proceeds to Operation Family Fund. This organization is in place to help the families of wounded or killed soldiers. 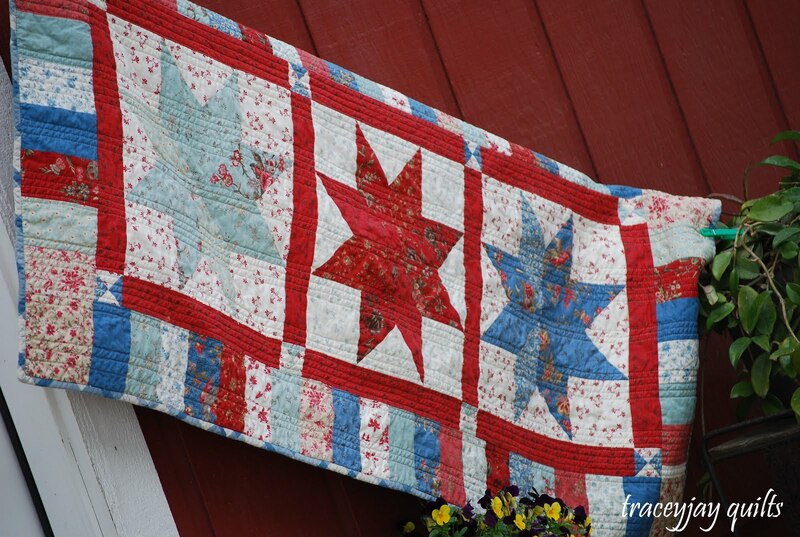 Please visit my blog, traceyjay quilts, for more information, and join me in remembering and appreciating the sacrifices made for freedom. 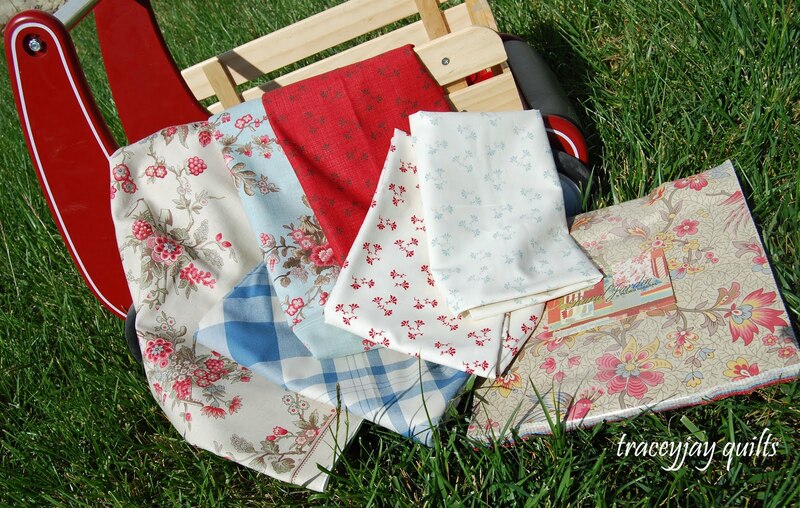 I’m also hosting a sponsored giveaway for a Rural Jardin layer cake… so come on over! 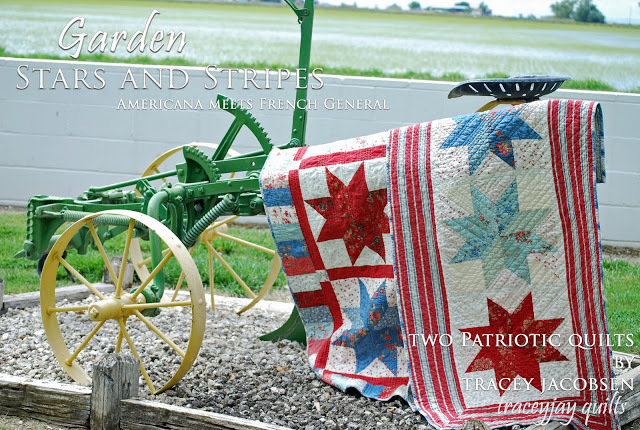 I hope you enjoy Garden Stars and Stripes. Option 2: Remaining woven stripe yardage. 1/2 to 1 yard of woven fabric (I did mine as continuous binding and only needed 1/2 yard. 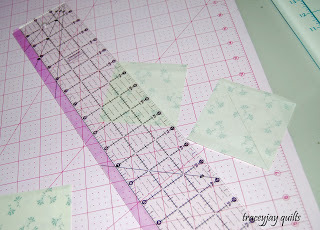 If you want to do bias binding, you might be happier with 1 yard). Choose 4 layer-cake squares for each block (4 Bleu Clair, 4 Woad Blue, 4 Rouge). Cut each block in to two 3 1/2″ x 10″ strips. 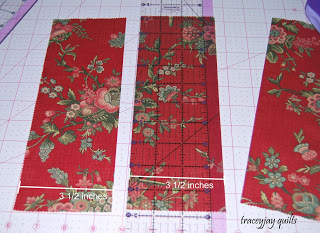 You will have a 3″ strip leftover –save it — this will be used for the pieced border of Option 1. On the wrong side of your 3 1/2″ square background pieces, draw a diagonal line. 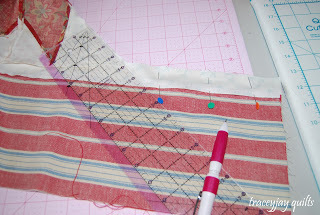 Sew on the line, starting in the top-left corner for 4 of the strips, and the top right corner for 4 of the strips. You then need to trim this rectangle. 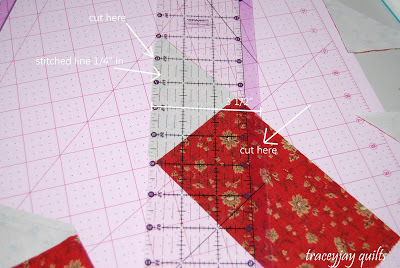 Cut 1/4″ away from the seam you just stitched on one side, and then cut 3 1/2″ away from the edge you just cut. See picture below. Before you press the seam open, you should have the shape of a parallelogram (more specifically, you will have a rhombus; most would call it a diamond). 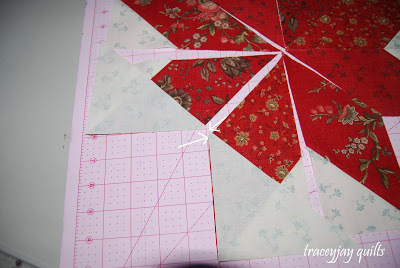 For Option 1 — Save and set aside the triangles of background and colored fabric you cut from the top portion. Press seams open. You now have your eight star segments. Arrange them into a star, in a layout that pleases you. To add the corner background pieces, take the triangles you cut from the 5″ squares and line them up in the blank spaces of the star. When you place them right sides together, you will notice there is a 1/4″ overlap (see arrow below). This is important to have so that when you open the seam, the hypotenuse (long edge) of the triangle you just added lines up with the inner edge of the star segment. Join those two segments together to form one quadrant of your square. Join your bottom and top quadrants to form halves, and your halves to make a whole. 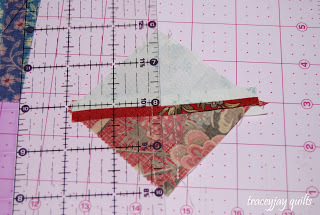 Your block should measure very close to 15″ square at this point. The star blocks are constructed the same for both options. Make one in Woad Blue, Clair Bleu, and Rouge. This is a bulky block (as far as seams go) with many pieces cut on the bias (bias tends to stretch). After trying various methods, I found pressing my seams open created the least amount of bulk, and helped the block lie flattest. I also had a hard time getting a system that would allow all the seams to nest…I found they would nest for one set of seams, and then be both going the same direction for another. To avoid bulk, a poochy block, trouble nesting, and having dark red under white background, I pressed my seams open. But do what you’d like. 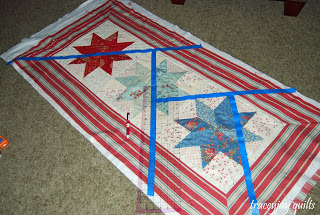 I had a difficult time figuring out what to do with borders for this quilt (thus the two options), but after receiving my Schnibbles Times Two (from Miss Rosie’s Quilt Co.), and seeing those leftover pieces from preparing my star blocks, the answer for a pieced border became obvious. Cut four 2 1/4″ x WOF strips from Rouge Juniperis. Sub-cut in to ten 2 1/4″ x 15″ sashing pieces. 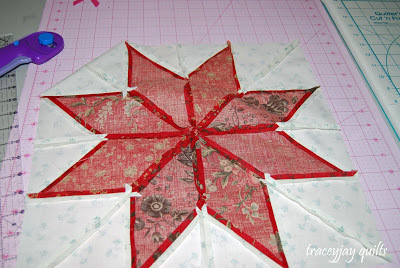 Sew on vertical sides of star blocks and join the three blocks together. Your row will be sashing, block, sashing, block, sashing, block, sashing. 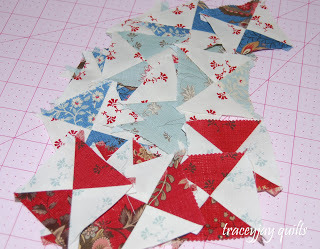 Sew leftover triangle pieces (from star blocks) together. Press seams open. Line up these squares so that the dark and lights are opposite one another, and draw a diagonal line from the unsewn corner to the opposite unsewn corner. 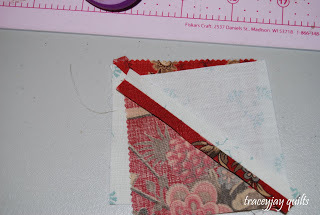 Sew 1/4″ away on both sides of drawn line. Cut drawn line to form two mini hourglass blocks. Make as many as you’d like with your leftovers, but you only need eight. I used the blues for my cornerstones, in order to contrast with the sashing. 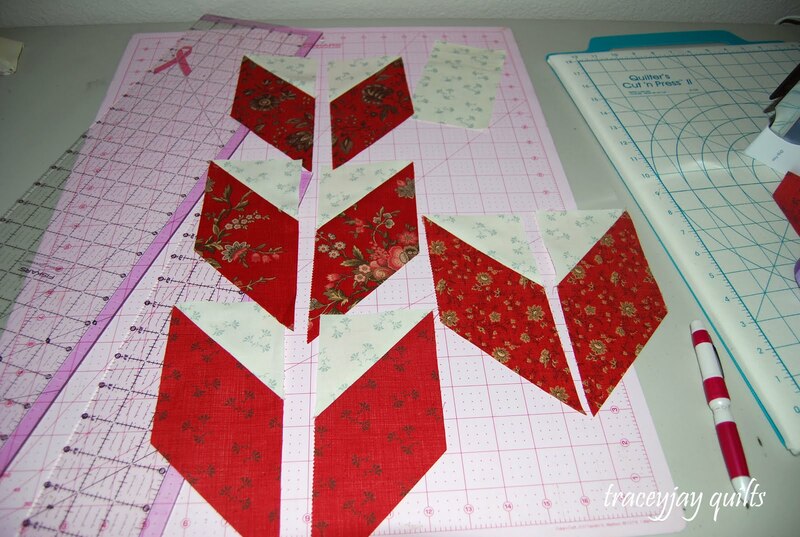 Trim to 2 1/4″ squares (cutting a little from each side, to keep the design centered). Attach a mini hourglass block to a 15″ sashing piece. I was careful to measure each segment as I went, making small adjustments as necessary, to ensure that the cornerstones lined up with my vertical sashing pieces (as shown). 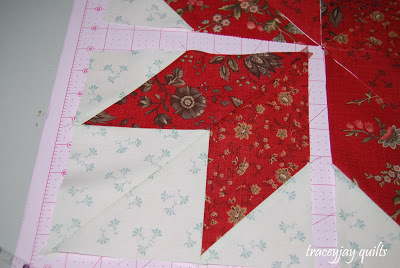 Sew to top and bottom of star blocks, pinning at intersections. Choose 6 contrasting layer cake pieces, and sub-cut in to three 3″ x 10″ rectangles. Add these rectangles to the 12 strips leftover from creating the star blocks. Choose blocks that create a nice variety of strips. Choose one layer cake square, and cut it into four 5″ squares for the corners. You may also need a small scrap, to help line up sides (I did). 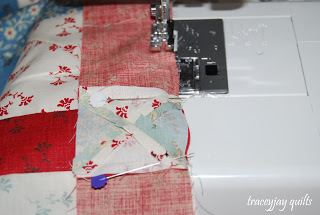 For the sides, use 7 strips and sew them together. Add a scrap or adjust seam allowances as necessary to make the edge fit. 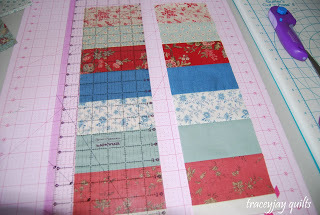 Cut these strips in half to form two border sections. Attach to sides of quilt. 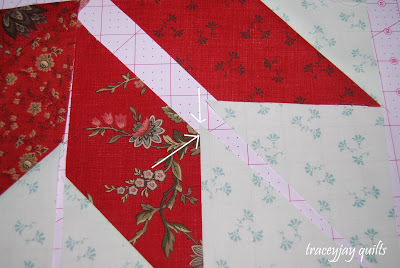 For the top and bottom borders, begin and end each section of border with a 5″ square corner piece. You will then need 20 strips to create the top and bottom sections. My quilt did not need a scrap or any adjustment of seam allowances, but make sure you measure your actual top to see if this number of strips fits. Cut in half (as you did with side sections) and sew to top and bottom of quilt. Option 1 Quilt top is complete! I normally never pre-wash; however, you may want to pre-wash the woven. 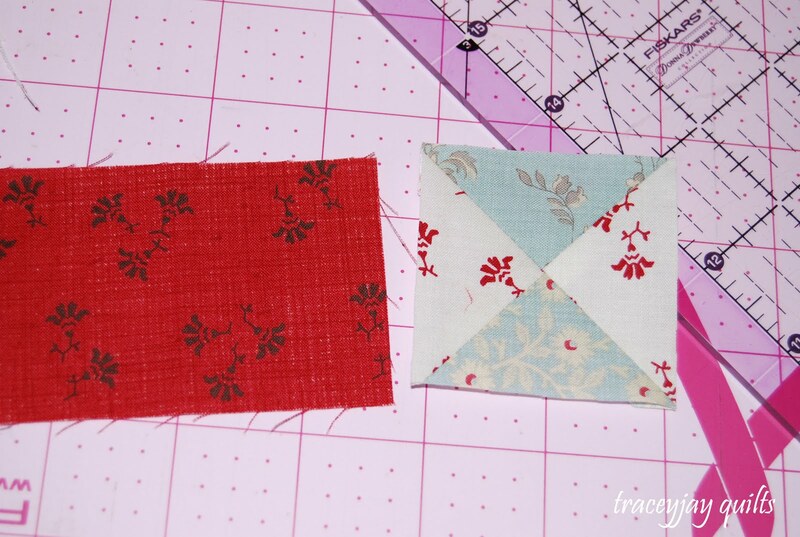 It seemed to shrink more than the other fabrics… not a problem if you like your quilts very crinkly, like I do. 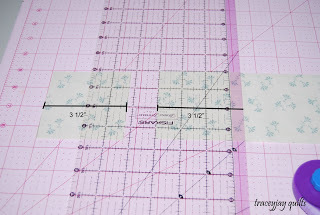 Cut six 1 1/2″ x WOF strips from Chanvre and Blue Juniperis background yardage. 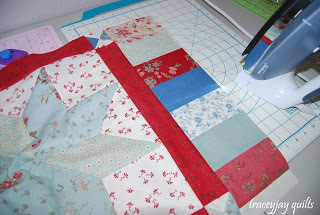 Use the two 1 1/2″ x 15″ strips to use as sashing strips between your star blocks, and sew your three blocks together. 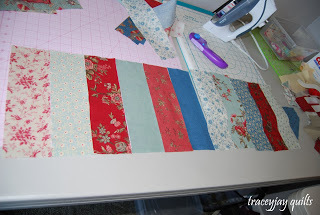 Do not sew sashing strips to the outside edges. At this point, your row will be block, strip, block, strip, block. 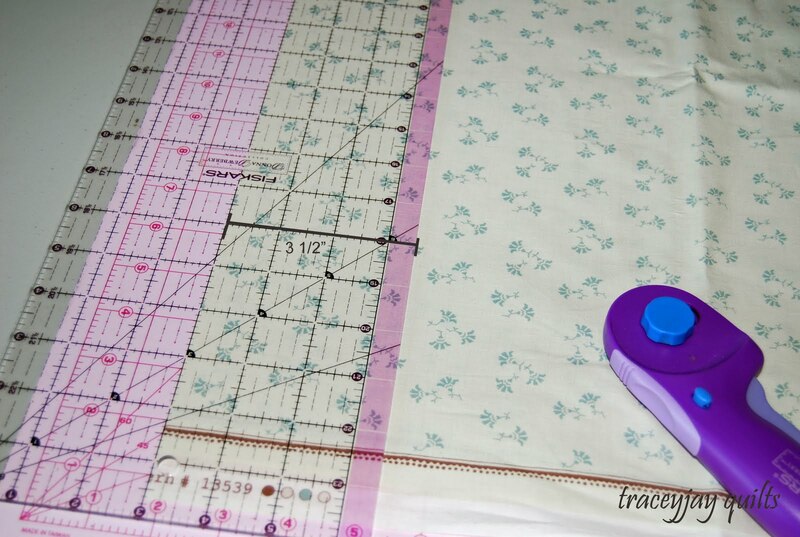 The measurement of your quilt top thus far should be about 15″ x 47″. 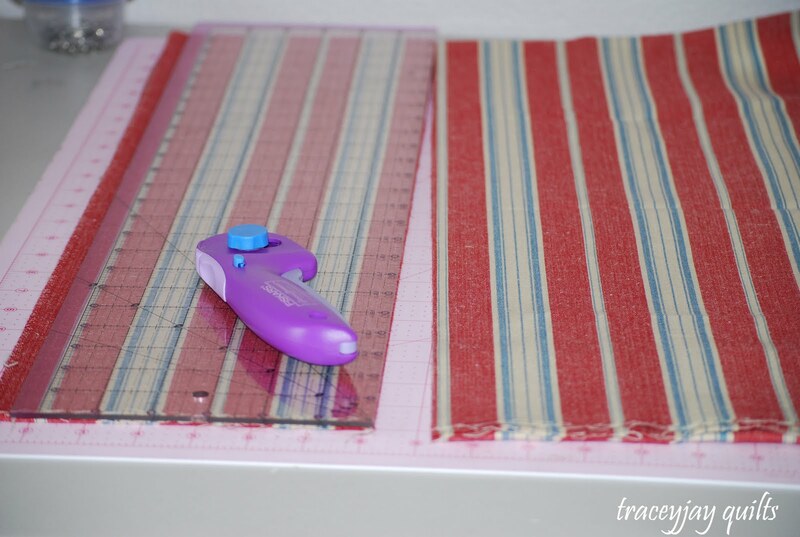 Fold your 2 1/2 yards of woven stripes so that you will be able to cut it along the selvage edge. Cut 7″ (but no more) from the both selvage edges (I trimmed the selvages after I made the main cut, leaving 6 1/2″ of border fabric.) The remaining fabric will be just the right size for backing. You should now have two 90″ x 6 1/2″ border lengths. Sub-cut them in to two 30″ lengths, and two 60″ lengths. We will be creating multiple mitered borders. 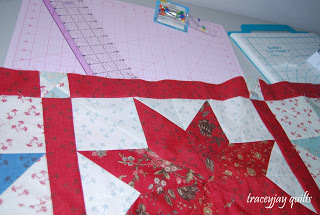 Julie, of jaybird quilts, has a great tutorial here. I’ll add just a few notes and images below for those unfamiliar with the technique. Attach the white inner border to the woven border strips. Press the side border seams towards the outer border, and the long border seams out towards the inner border. This allows the seams to nest. 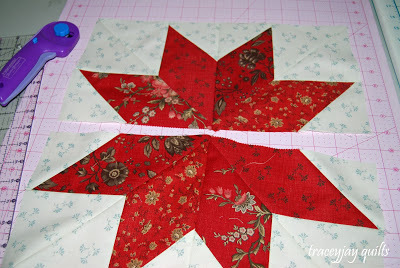 Don’t forget to start and stop your seams 1/4″ from the edge of the star blocks. Here’s what the over-lap will look like. 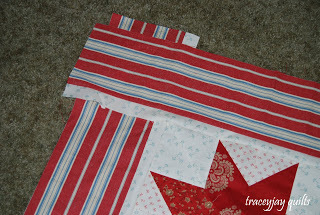 When you fold the corner down, fold along the diagonally angled seam in your star block. 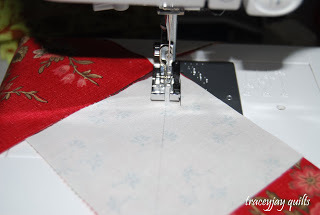 Draw your stitching line from this seam, not the edge of the fabric. Julie’s tutorial is great if you need any more instruction than this. Your quilt top is finished! I angled my quilting lines, kind of like a braid. Taping and drawing guidelines really helped. Label, Layer, Baste, Quilt, Bind, Wash, Dry, Admire, Celebrate. 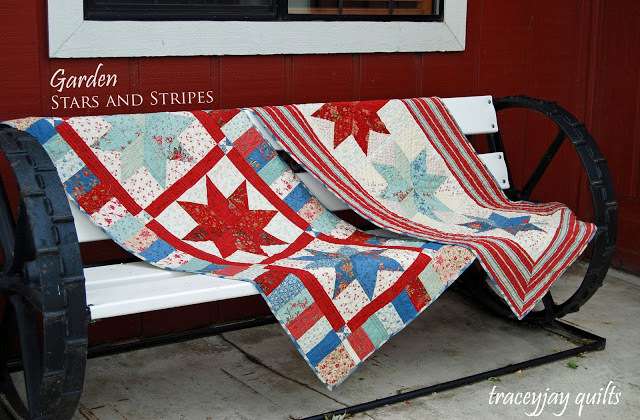 A Patriotic table or wall quilt classy enough to leave up after the Fireworks. 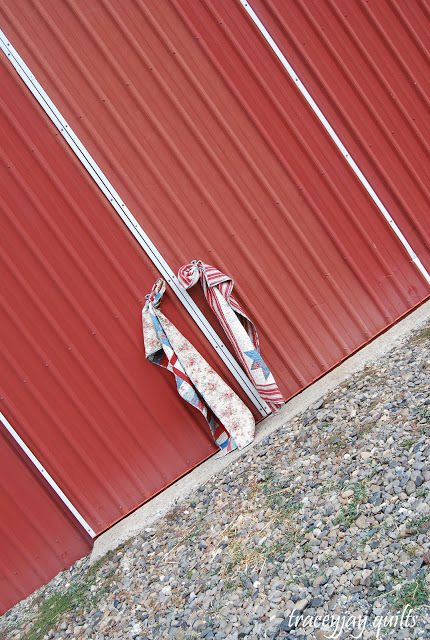 Measures approximately 56″ x 26″ all crinkled up. 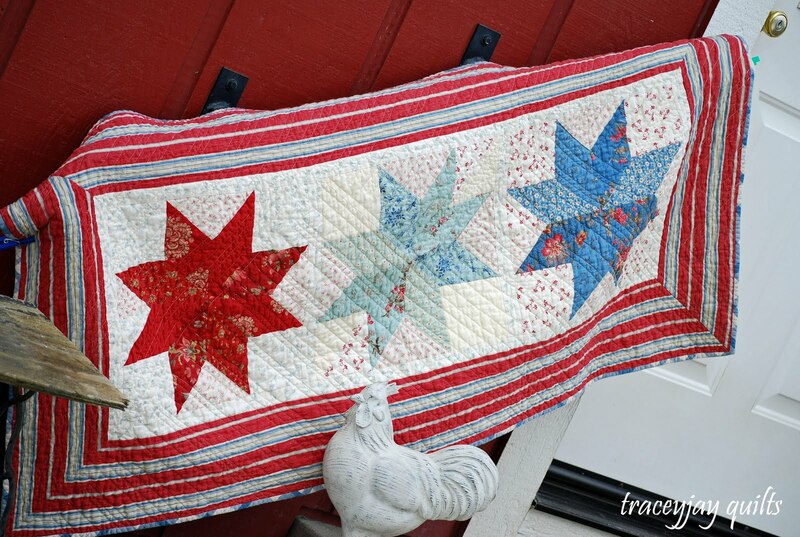 This entry was posted in Home Decor, Layer Cake, Moderate, Quilt, Seasonal and tagged Fourth of July, French General, Rural Jardin, traceyjay quilts.